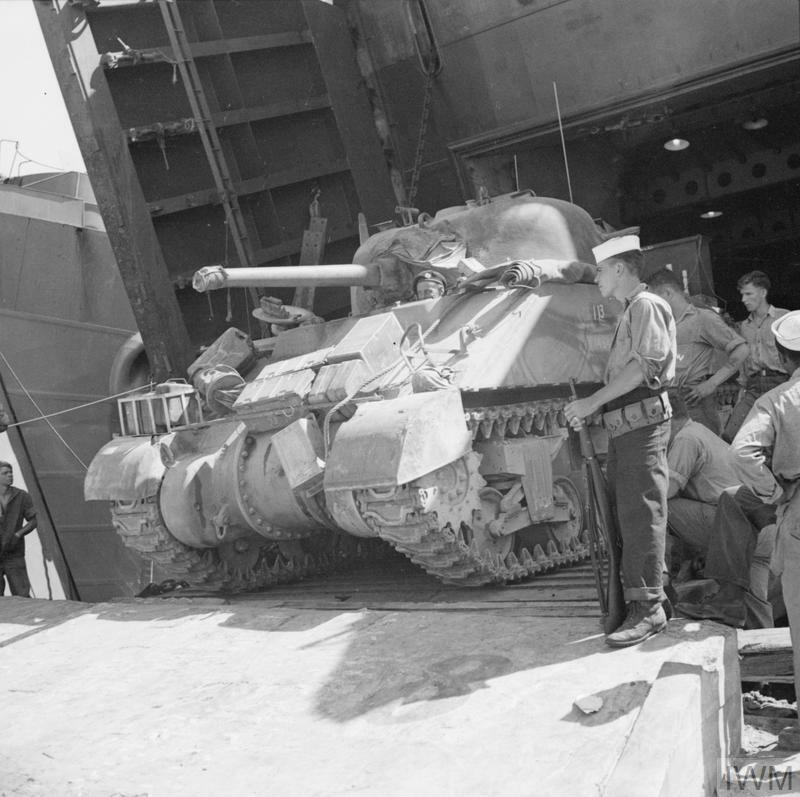 A newly-arrived Sherman tank being loaded onto a 'Z' craft to be taken ashore at Port Tewfik, Egypt, 9 Sep 1942. IWM photo E 16603. 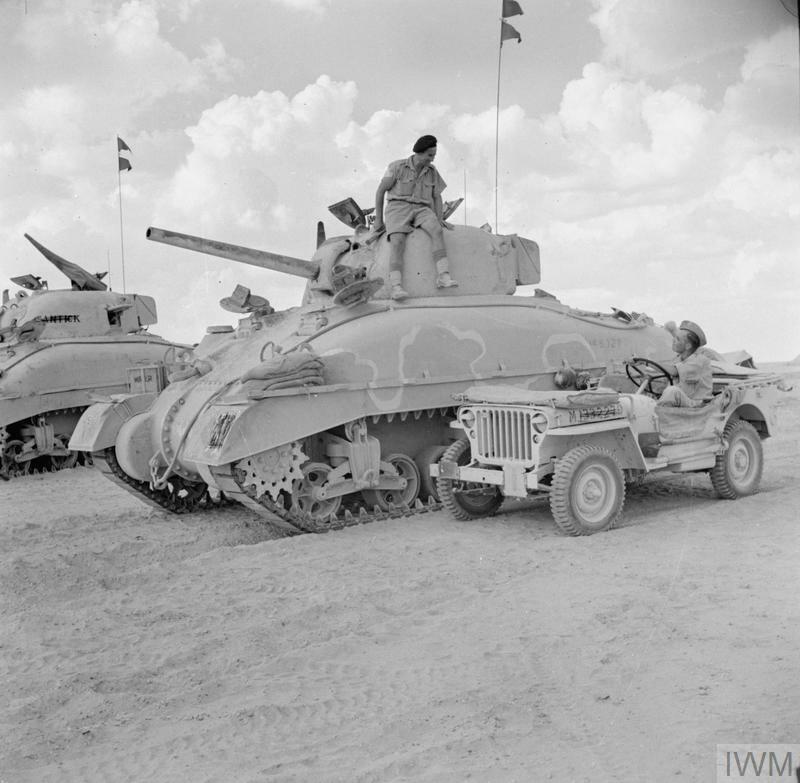 A jeep and Sherman tanks of HQ 2nd Armoured Brigade, 10 Oct 1942. 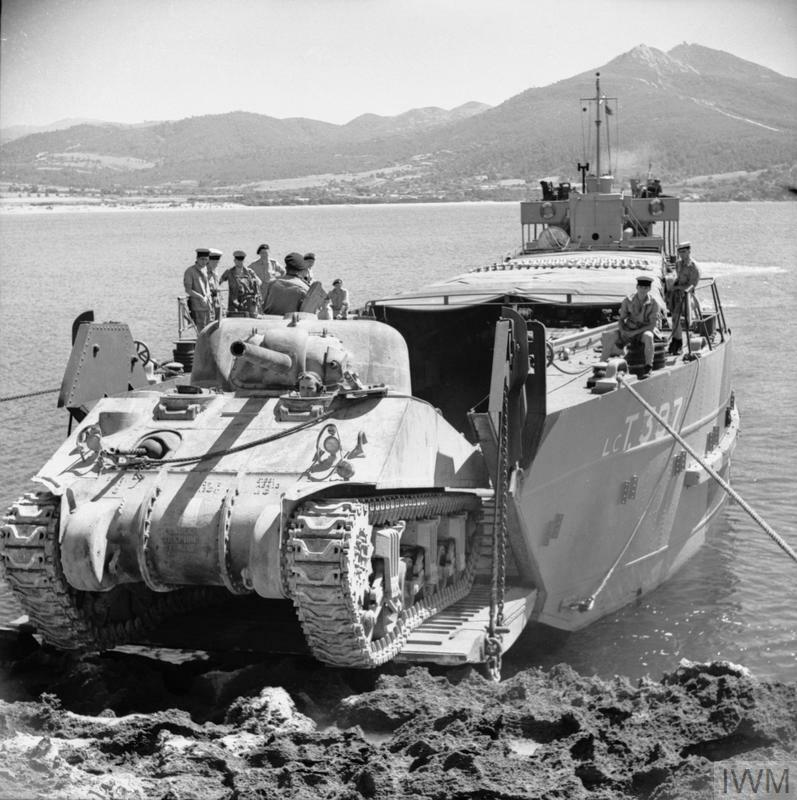 "The white line on the tank was being used as a guideline by the Camouflage Unit who were called away before completing the painting of the Brigade's tanks." IWM photo E 17898. 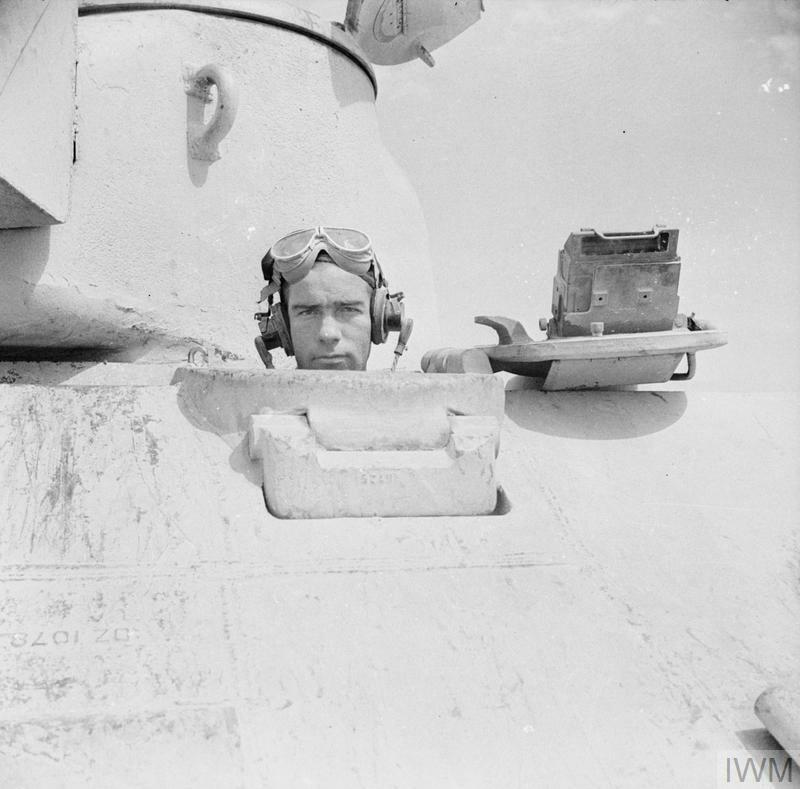 Close-up of the driver of a Sherman tank, 13 Oct 1942. IWM photo E 17966. 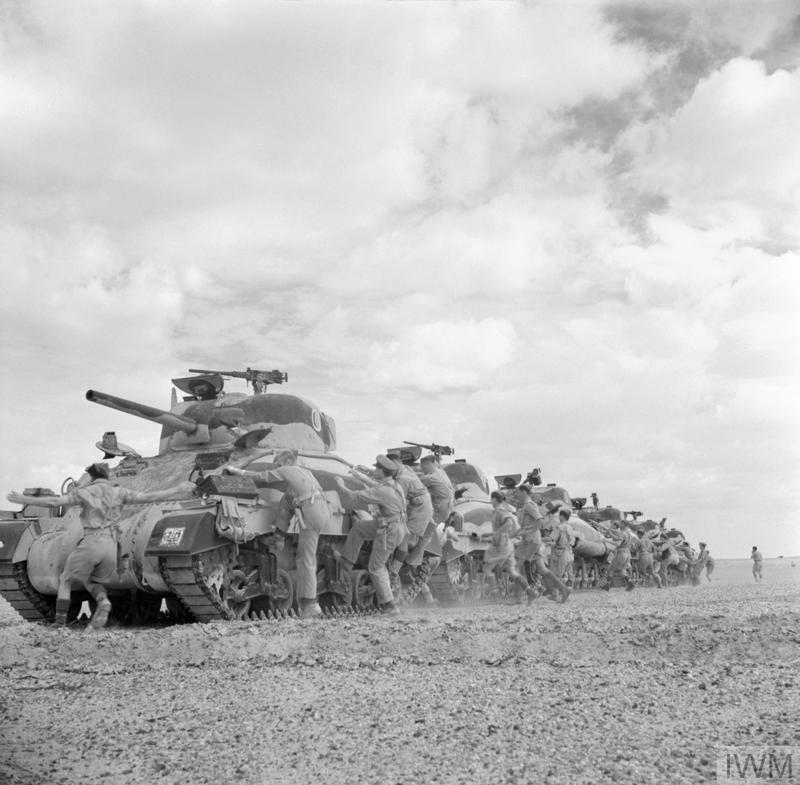 Crews climb aboard Sherman tanks of The Queen's Bays (2nd Dragoon Guards), 1st Armoured Division. 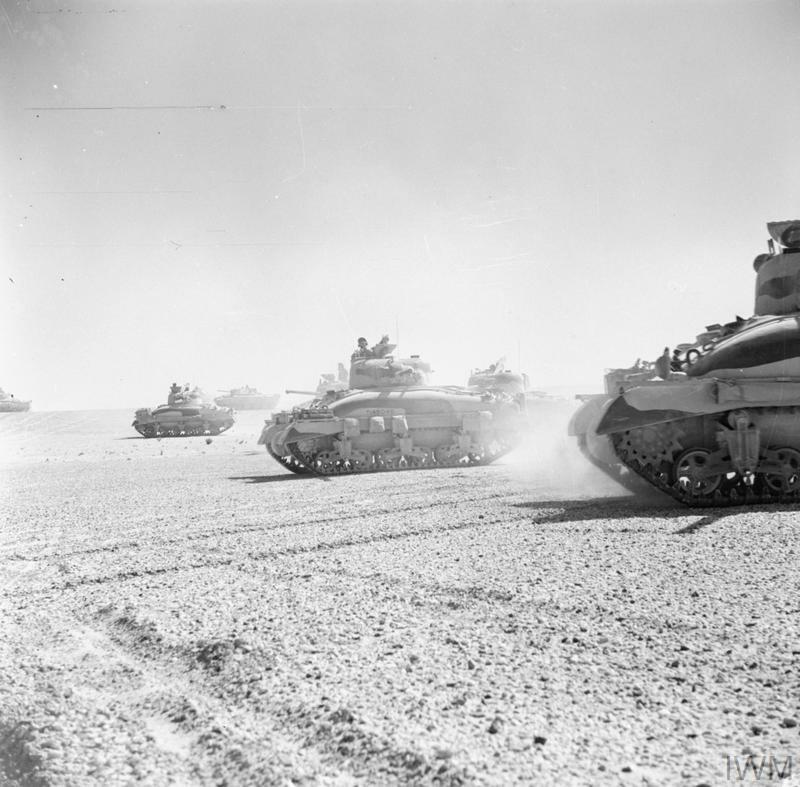 El Alamein, 24 Oct 1942. IWM photo E 18376. 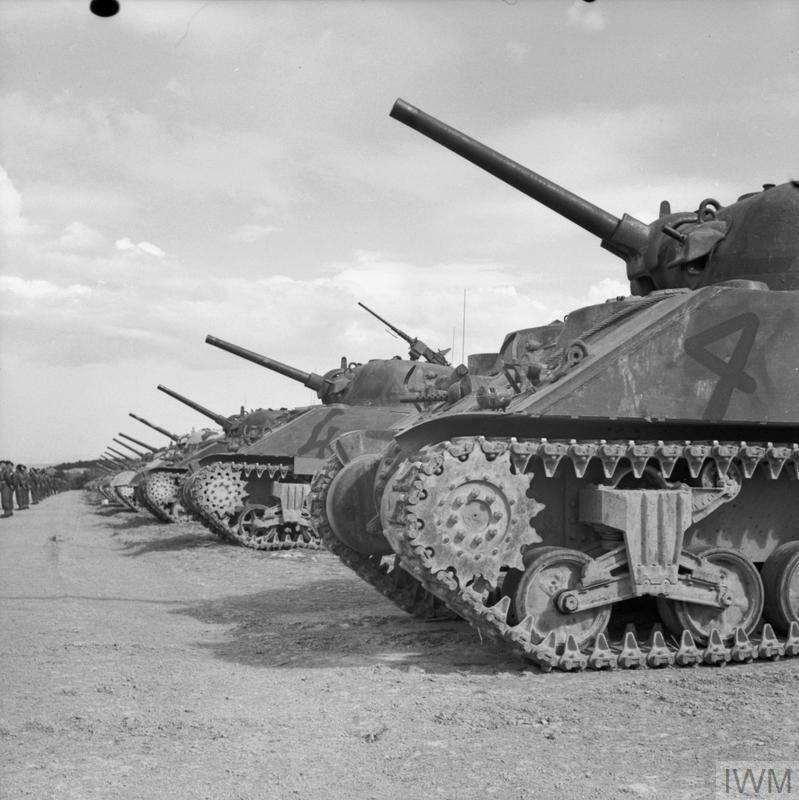 Sherman tanks of The Queen's Bays (2nd Dragoon Guards), 1st Armoured Division. 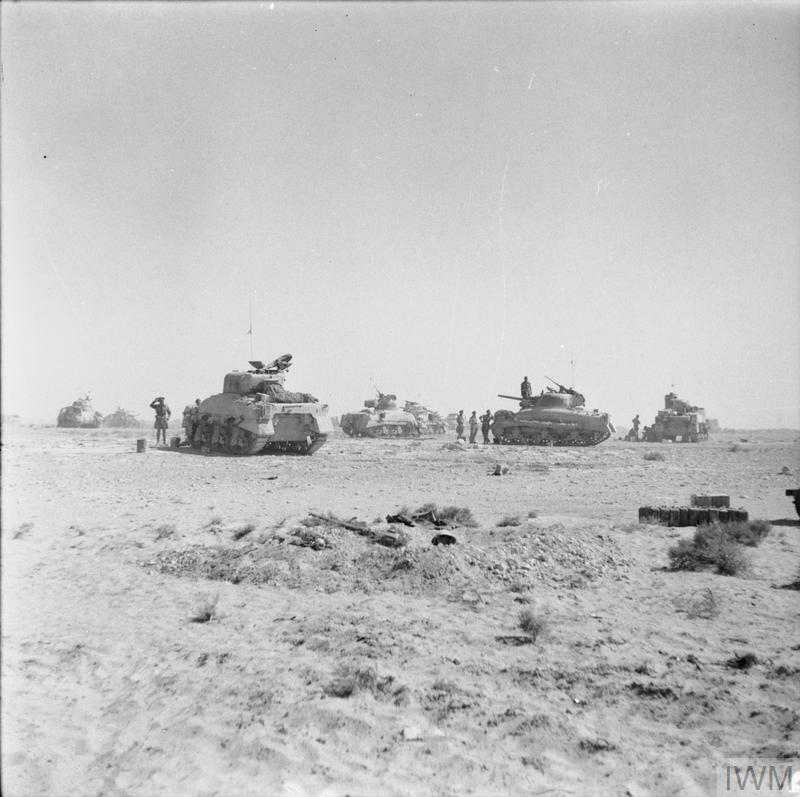 El Alamein, 24 Oct 1942. IWM photo E 18377. 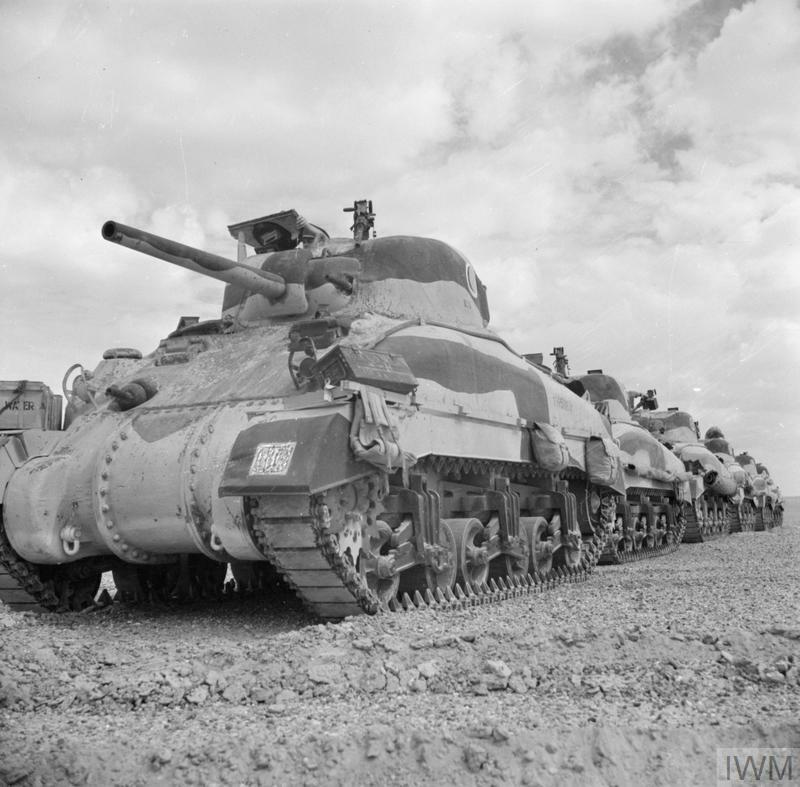 Sherman tanks of The Queen's Bays (2nd Dragoon Guards), 1st Armoured Division. 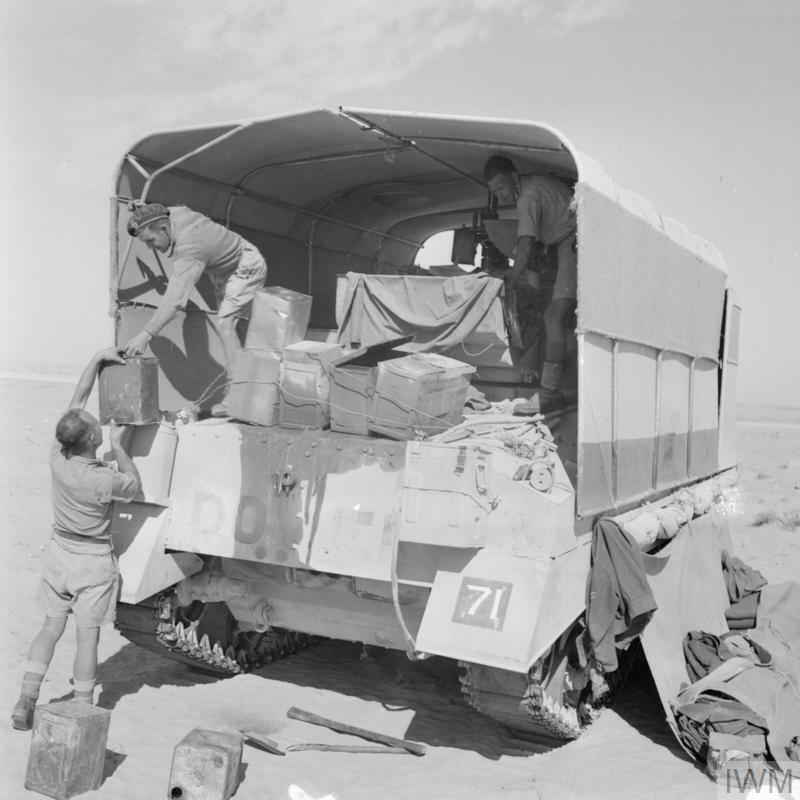 El Alamein, 24 Oct 1942. IWM photo E 18379. 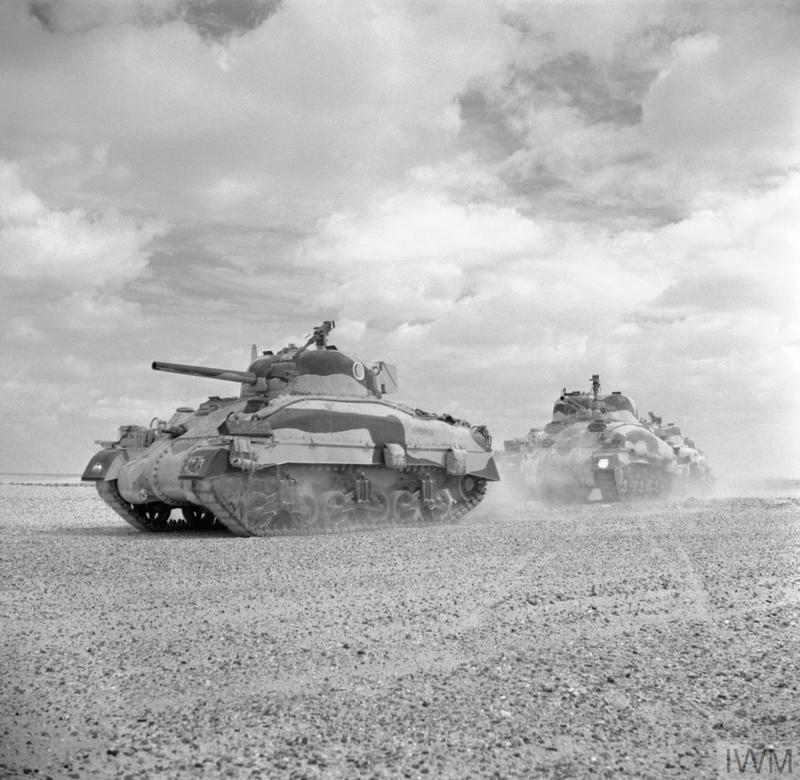 Sherman II tanks of the Queen's Bays (2nd Dragoon Guards), 2nd Armoured Brigade, moving up to the Alamein line, 24 Oct 1942. IWM photo E 18380. A Sherman tank of HQ 24th Armoured Brigade, with its 'sunshield' lorry camouflage erected, 26 Oct 1942. IWM photo E 18463. 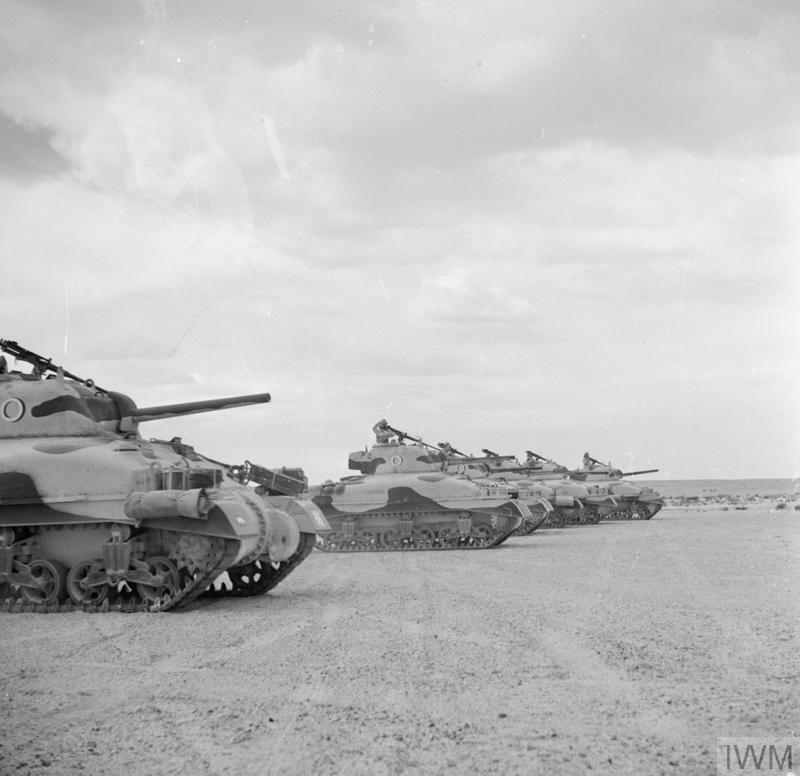 Sherman tanks of 8th Armoured Brigade waiting just behind the forward positions near El Alamein before being called to join the battle, 27 Oct 1942. IWM photo E 18531. 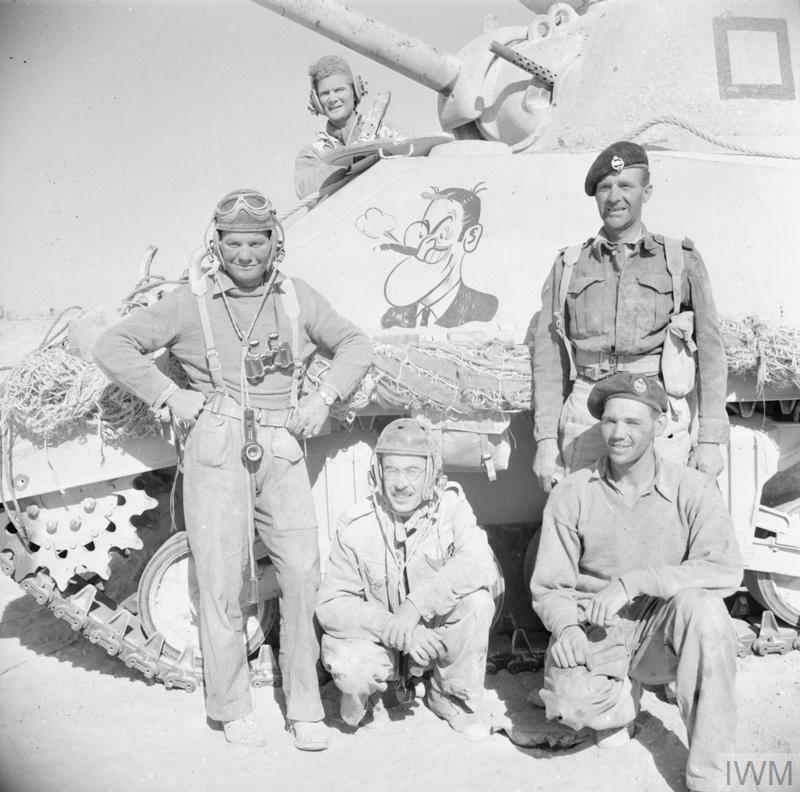 The crew of a Sherman tank pose beside their vehicle, decorated with a cartoon figure, during a break in fighting in the Western Desert, 29 Oct 1942. Note that three of the men are wearing American tank helmets, which were generally unpopular with British crews. IWM photo E 18696. 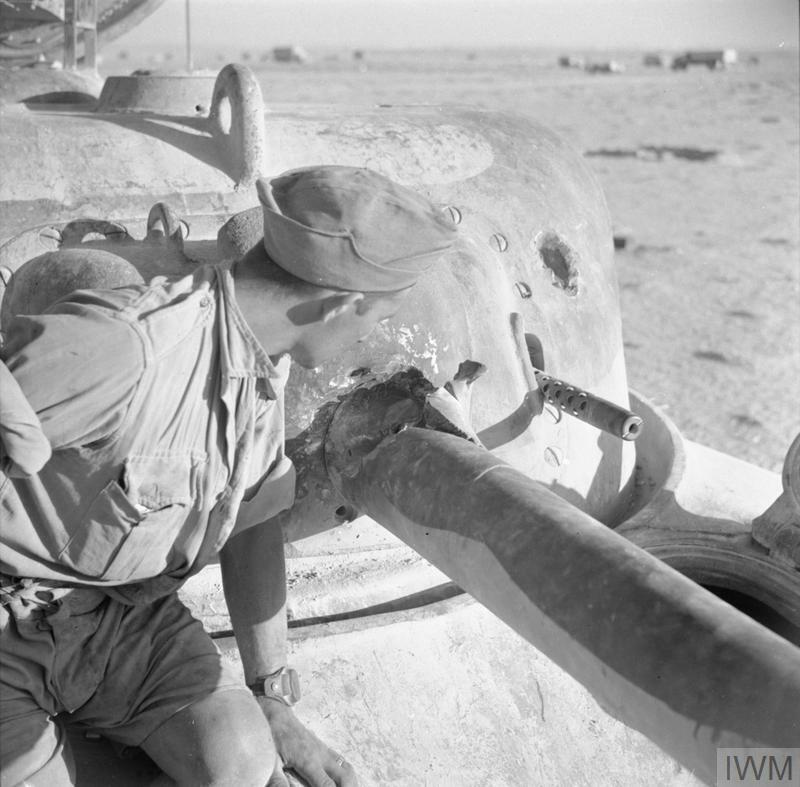 A soldier in the tank recovery section of the Royal Electrical and Mechanical Engineers (REME) examines damage inflicted by an 88mm anti-tank gun to the barrel of a Sherman tank, which is about to be recovered from the battlefield, Oct 1942. Another shell hit can be seen on the side of the turret. IWM photo E 18707. 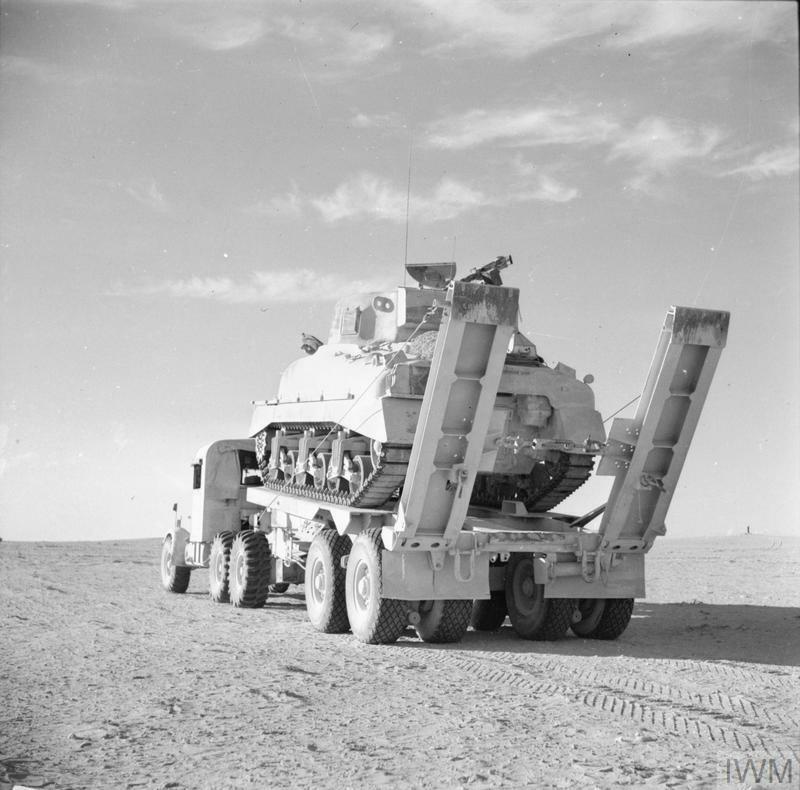 A Scammell Pioneer tank transporter carrying a damaged Sherman tank back to a REME repair workshop in the Western Desert, 29 Oct 1942. IWM photo E 18712. 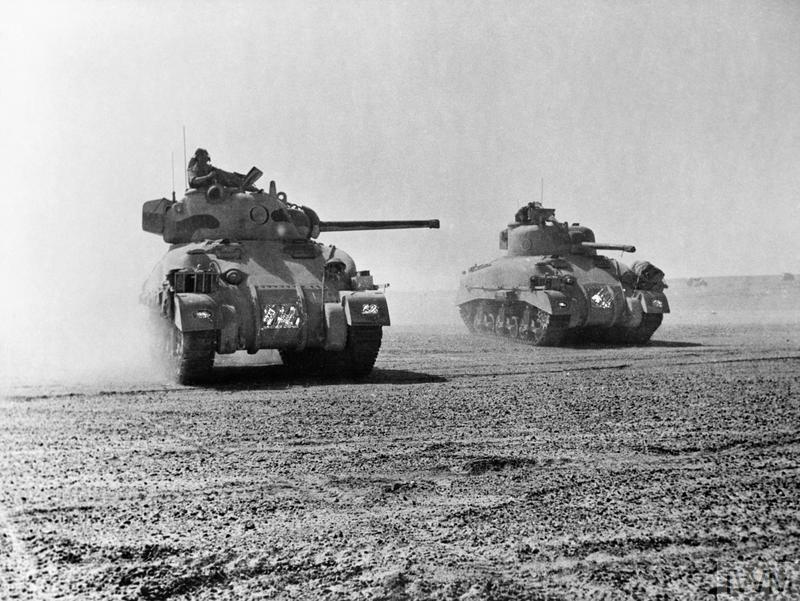 Sherman tanks of the Eighth Army move across the desert at speed as the Axis forces begin to retreat from El Alamein. IWM photo E 18971. Sherman tanks of 'C' Squadron, 9th Queen's Royal Lancers, 2nd Armoured Brigade, 1st Armoured Division, 5 Nov 1942. IWM photo E 18972. 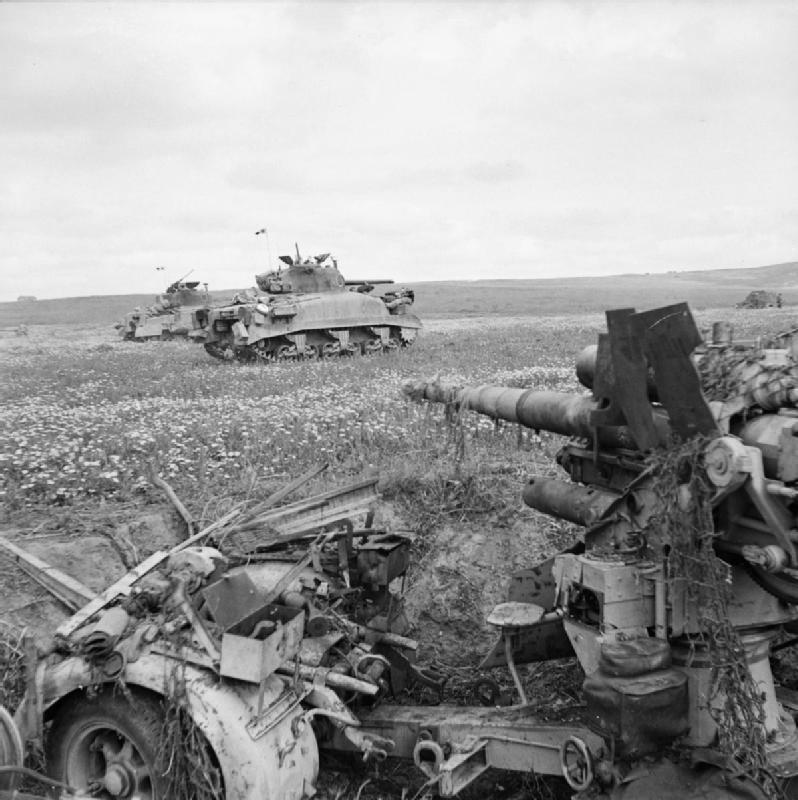 Sherman tanks of 'C' Squadron, 9th Queen's Royal Lancers, 2nd Armoured Brigade, 1st Armoured Division, 5 Nov 1942. IWM photo E 18973. 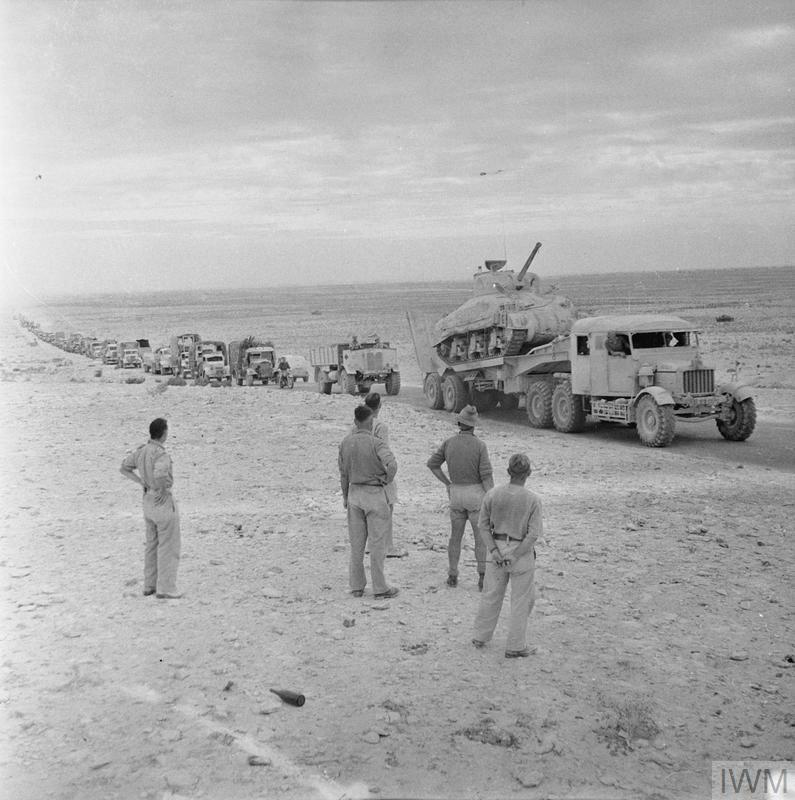 A long line of transport, including a Sherman tank on a Scammell tank transporter, moving along the coast road in pursuit of the enemy, 11 Nov 1942. IWM photo E 19296. Sherman tanks during the advance along the coast road towards Tripoli, 27 Jan 1943. IWM photo E 21797. 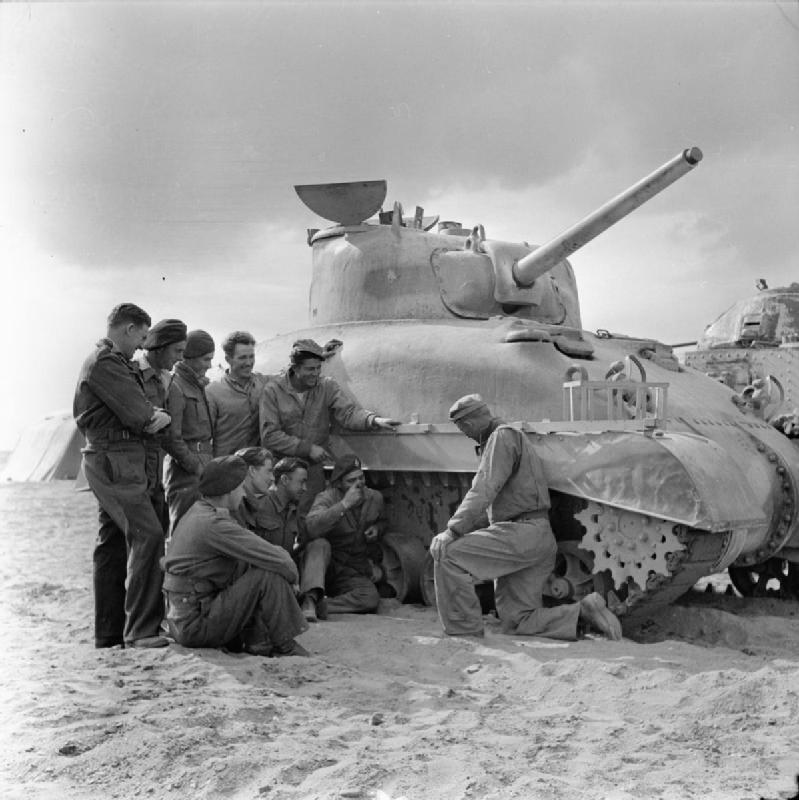 English, South African and New Zealander tank crews receive instruction on the Sherman tank by an American instructor at Dab el Haag training camp near Cairo, 24 Feb 1943. IWM photo E 22596. 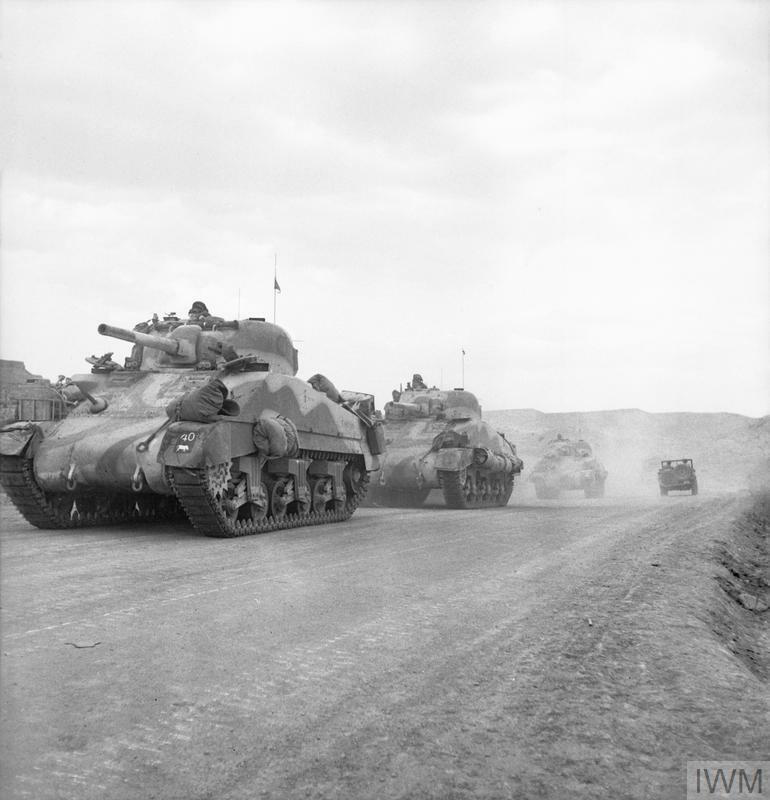 Sherman tanks move up during the advance to Kasserine, 24 Feb 1943. IWM photo NA 847. Newly-arrived Sherman tanks on the quayside in Tripoli, 15 Mar 1943. IWM photo E 22968. Sherman tanks on parade during a visit by the Turkish Military Mission, 28 Mar 1943. IWM photo NA 1574. 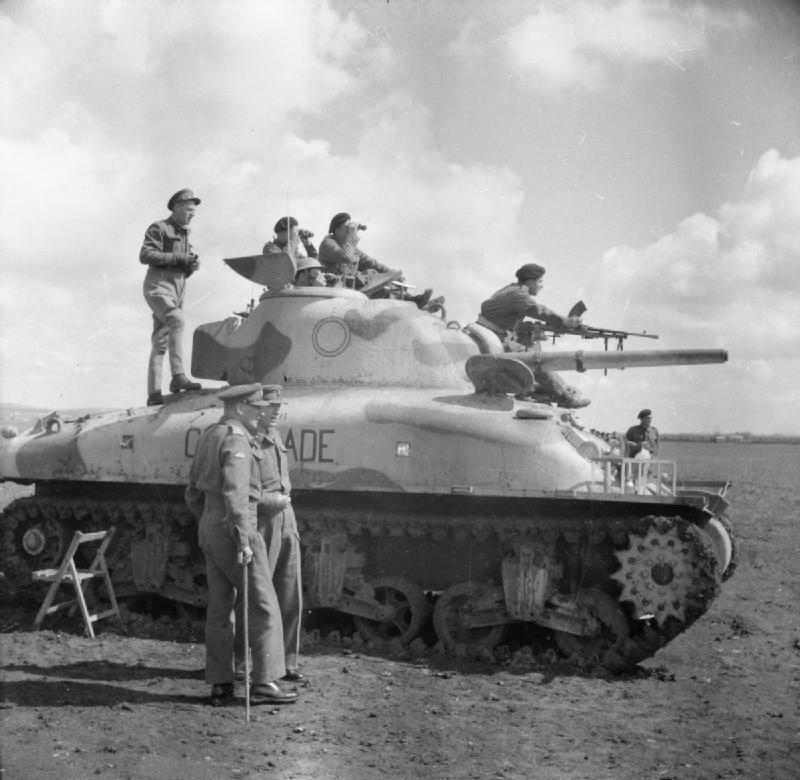 LTG W. G. Holmes, GOC 9th Army, stands on a Sherman tank of the Wiltshire Yeomanry to watch a gunnery display, 5 Apr 1943. IWM photo E 23451. 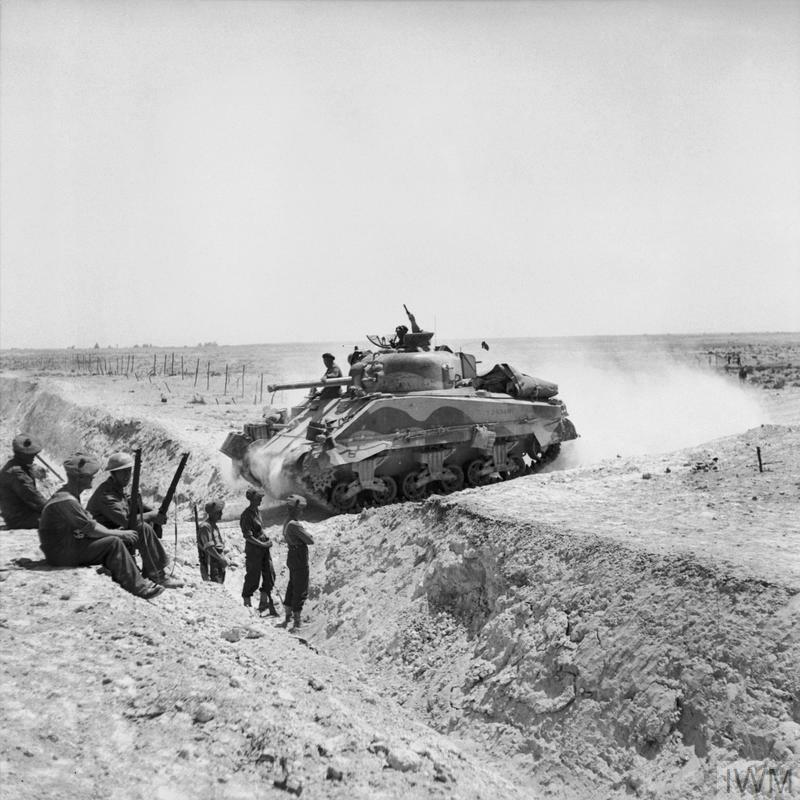 A Sherman tank crosses an anti-tank ditch during the advance through the Gabes Gap, Tunisia, 6-7 Apr 1943. IMW photo NA 1877. 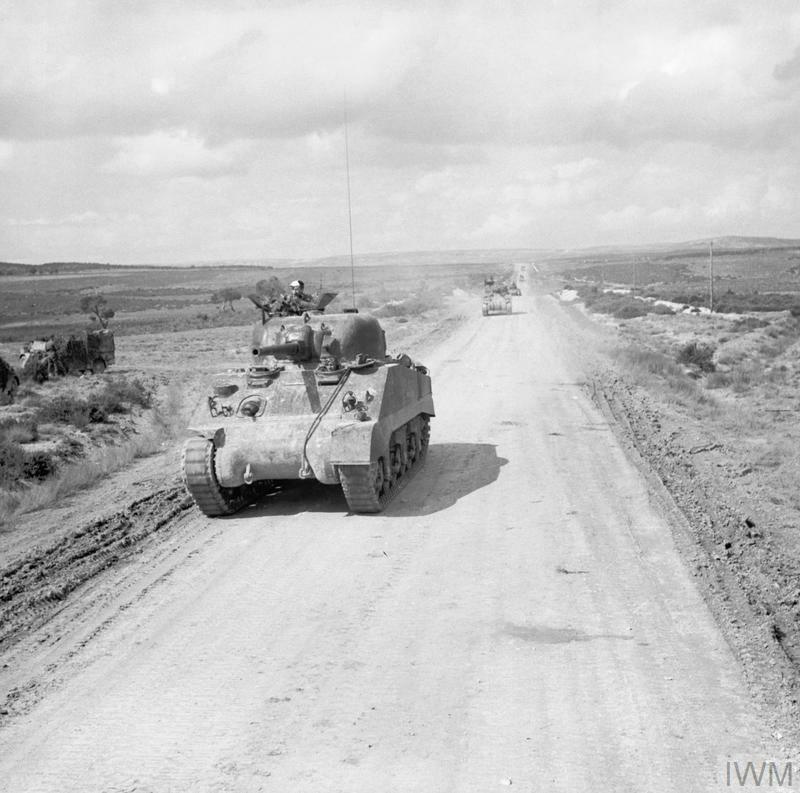 Sherman tanks of the Queen's Bays (2nd Dragoon Guards) advance through the Gabes Gap, 7 Apr 1943. IWM photo NA 1809. 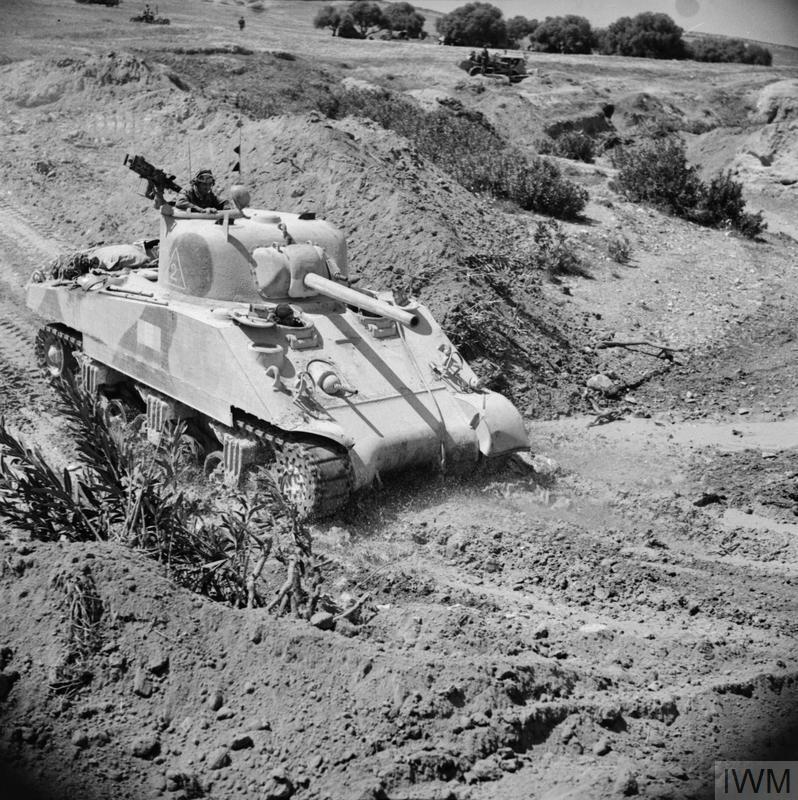 A Sherman tank crossing a wadi, 22 Apr 1943. IWM photo NA 2359. Sherman tanks advance past a knocked-out anti-tank gun of the type ''8.8-cm-PaK 36''. Tunisia, 23 Apr 1943. IWM photo NA 2321. 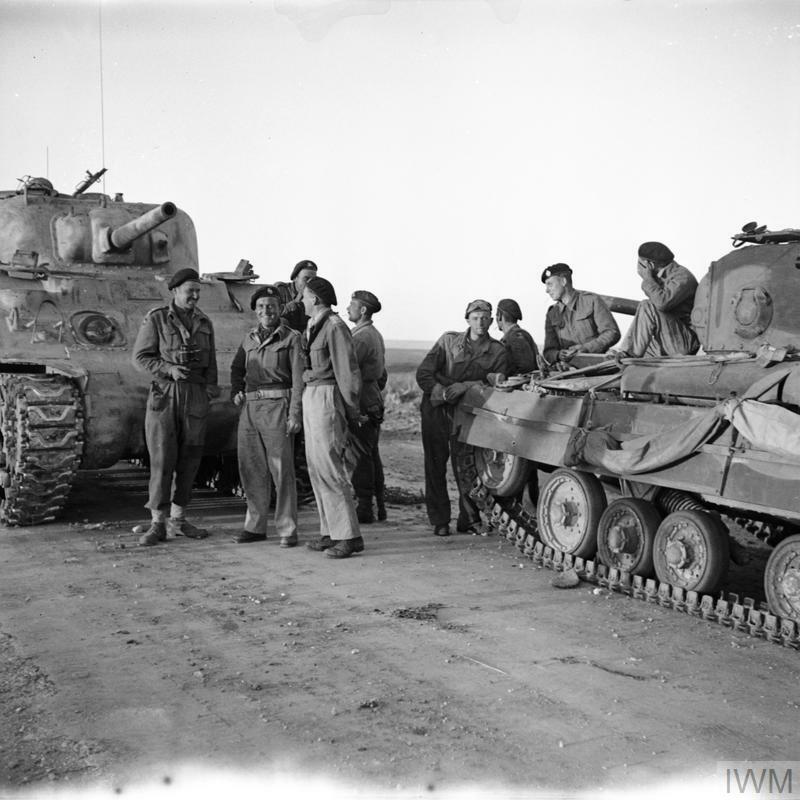 A Sherman tank crew greets a Valentine tank crew at the link-up of the First and Eighth Armies at Bou Ficha, Tunisia, 14 May 1943. IWM photo NA 2921. A Sherman tank leaves a landing craft during an exercise on the North African coast, 6 Jun 1943. IWM photo NA 3513. 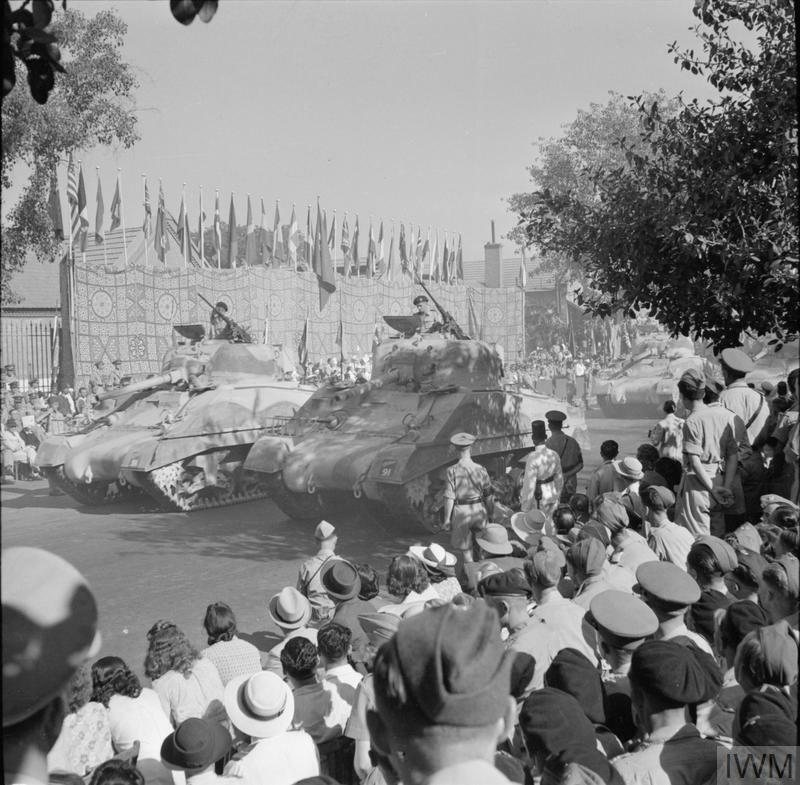 Two Sherman tanks taking part in the United Nations parade in Cairo which saw 5,000 troops and vehicles pass through the city, 14 Jun 1943. IWM photo E 25247. 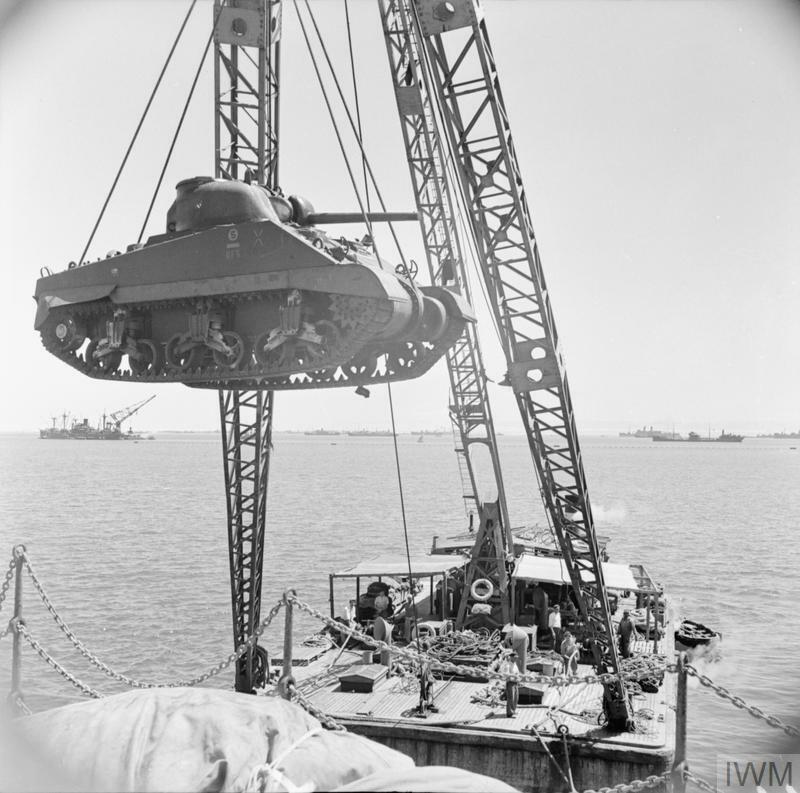 A Sherman tank of 40th Royal Tank Regiment reversing into a landing ship at Bizerta, 4-9 Sep 1943. IMW photo NA 6653.